My friend Glenn, The Philosopher, allowed me to get in on the fun when he showed me a project he was beginning in which he was going to re-cast his wedding band so that once again it would fit his finger. Some of you have known me long enough to know my own wedding ring/finger story, but I’m not sure if I’d told it to Glenn, The Philosopher, yet. I’d considered asking Allison if I could replace my wedding band. It had cut me a few times with its jagged bits from the quick melt, but Allison, out of context, had mentioned to me that wedding bands couldn’t be replaced – there was too much symbolism attached. So I kept my mouth shut. When I heard what Glenn was doing, I saw the chance to make it right, and ADD symbolism in the process. I thought it would be totally awesome to re-cast the same gold from my original band, seeing as how that seems to be the secret to marital longevity. The re-casting of the original material is quite necessary every time we become aware that something is awry. Sometimes the original sheen is lost and merely needs a good polishing. Sometimes jagged edges form, and must be sanded and smoothed. Sometimes, the original purity is lost and refining is necessary. One of the toughest bits of a relationship is the reclaiming of the sullied. Relationships have things stolen, carelessly discarded, or given away that are detrimental to the bond. Some of these things can simply be let go. Some of them have to be reclaimed, redeemed, bought back. And sometimes, the price is high. Allison was right. As long as a wedding band still fits, it can’t be replaced. Too much symbolism. But just as a scarred and jagged gold band symbolizes all that has been overcome in a couple decades of marriage, a re-claimed, redeemed, re-cast wedding band symbolizes what has happened, and continues to happen to bring about healing, growth, and strengthening that holds a couple together. Things that are lost in a marriage don’t have to stay lost. Even things that were stolen or carelessly given away can be redeemed and reclaimed. So the Philosopher and I have been learning and practicing so that we can accomplish this important task. We’ve tried and failed to cast practice rings of brass and copper. On Saturday, we tried again, but I brought to the fire an ounce of Sterling, thinking that tonight was the night we’d have success. 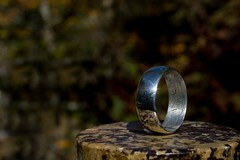 Indeed, the result was my first self-crafted ring. And the entire process was full of meaning. Truly, there are symbols and processes involved in making that symbol that I’ve never heard anyone talk about in any wedding ceremony. In fact, it may not matter to a couple just beginning. It takes time to understand anyway. Perhaps the mention of these things in a wedding ceremony would fall on deaf ears. I don’t know. Perhaps it is enough to rehearse the bits about the purity and preciousness of the metal, about the never-ending nature of the ring, but one should at least know that his symbol was created by melting bits under extreme heat so that they puddled and formed a single precious object. One should know that the molten metal was poured into a cast formed by carefully modeling a ring that represented the final desired product. One should know that after it was formed, the ring was rough and discolored, and though it was precious metal, it required intense cleaning, and smoothing, and polishing before it could be worn as a beautiful symbol of a relationship that would require all the same processes to become beautiful. Now that I’ve successfully been through the process, I’m looking forward to every step required to reclaim my bent, beaten, scratched, too-small, jaggy wedding band. I’ll apply the heat, surrender the gold to the mold and smooth and polish with intense tender love, just as has been done to Allison and me through these formative years of relationship.